As mentioned in our latest blog, we would got into more detail on how to find and engage your target audience. Before the existence of social media, marketers used market research how to spend their advertising budgets on print television, radio and print advertisement. Nowadays, research organizations provide intelligence on consumer behavior on social media platforms. The following five tips will help you strategize your company’s social efforts to match the behavior of your customers. 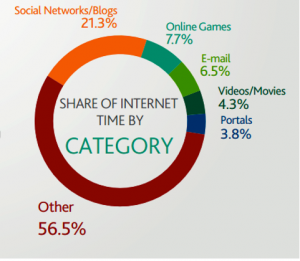 As you can see in the picture below, research done by Nielsen shows that only 3.8% total time spent online is spent on portals and a substantial 21.3% on social networks and blogs. Nowadays, there are hardly any internet users that don’t visit social networks, and there might be people that only spend 15 to 30 minutes per day, there are also people that spend multiple hours per week. Be sure to include social media along with other marketing strategies like email and video to your strategic marketing plan to reach your target audience. Facebook remains the most-visited social platform in the U.S. with 152.2 million visitors via PC, 78.4 million via mobile apps and 74.3 million via mobile web. Most time spent on social networking sites is spent on Facebook. Obviously, if you want to engage your customers through social platforms, you should invest in Facebook (while keeping an eye on the other social networking sites that are becoming increasingly popular). Furthermore, with the high number of impressions Facebook gives, it serves as an excellent display for your online ads. However, if you find out your customers spend their time on other platforms, such as LinkedIn or Twitter, you would be wise to focus your attention on those instead of Facebook. More and more people use the internet for online entertainment consumption. According to Nielsen’s study, multitasking while watching a television program is an increasingly occurring trend among owners of mobile devices. About 57% of those people check their email, 44% of them surfed the web for unrelated info, and 44% visited a social networking regardless of watching a television program or commercials. The two most visited websites are Facebook and YouTube. If your brand could engage those users in conversations about movies, television shows, or sporting events while they are actually watching it, it could reach an enormous amount of people. In the U.S. about 100 million videos are viewed on a daily basis. The increase of the average time for watching a video may introduce ways for marketers that want to produce edutainment videos. Those engaging videos combine education and entertainment and keep people watching. Like discussed in a prior weblog, not taking into account mobile marketing will most likely make you lose money because 8% of all internet traffic comes from mobile devices. PQ Media found that about 100 million users in the United States access the internet through their smartphone. For more information about incorporating mobile marketing in your marketing strategy, please read our blog entry about it.